SAN ANTONIO - The bats made their return to the AT&T Center court Thursday night. 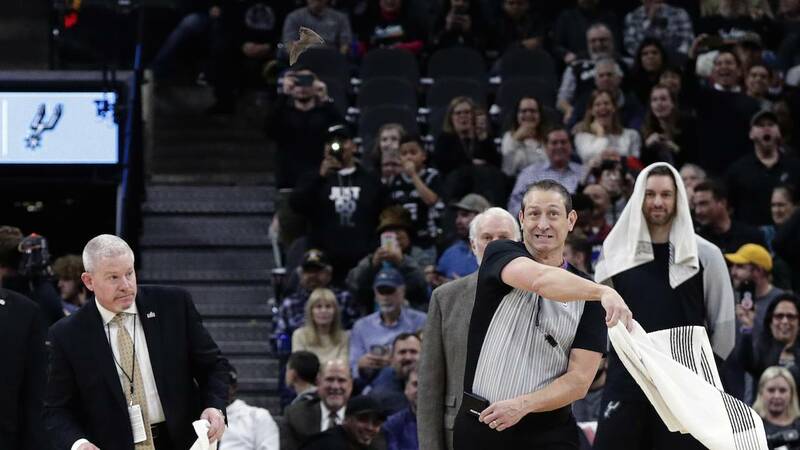 A group of bats caused a stoppage in play during the first quarter of the Spurs-Nets game. Spurs staffers went on the court with towels and nets in an effort to shoo away or catch the flying creatures. It appeared as if four bats flew onto the court. After a short delay, the bats flew to the rafters and play resumed. During the stoppage, fans in the arena began to chant Manu Ginobili's name. In 2009, Ginobili added to his legend with the Spurs when he swatted a bat out of mid-air during a game. Ginobili had to get a series of rabies shots afterward and admitted it was not the best idea. All players, fans and the bats all made it out safe on Thursday. Head coach Gregg Popovich was asked about the bat and Ginobili after the Spurs win. "We all talked about it. Eeverybody mentioned it," Popovich said.